Our roasted leg of lamb is the centerpiece of our Easter dinner, filling the kitchen with its tantalizing aromas of garlic, lemon and oregano. I posted this 3 years ago, but I decided to post it again for those of you who weren’t reading my blogs back then. 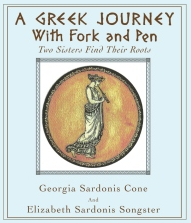 If you have our book, A Greek Journey With Fork and Pen, it is on page 73, however the recipe there is for oven roasting only, while here I have covered gas grill and charcoal grill roasting, as well. I have been known to roast one boneless in the oven and a bone-in roast on the grill. They both come out fabulous!! Our Orthodox Easter is very late this year, May 1! I has everything to do with Passover and the full moon, but can be very confusing. In any case, we are lucky enough to enjoy both Easter Sundays! And don’t think we don’t take advantage of the “after Easter sale on candy”!! Cadbury Eggs are a long-time favorite along with Dove dark chocolate with almonds. Jelly Bellys are always fun when trying to guess the flavor! That all comes after the feasting and contest, breaking of our red eggs, to see whose egg is the strongest! (And a week of egg salad sandwiches with a slight tint of red). Traditions are lovely and I hope in this ever-changing electronic world, we can hold onto those family traditions that define us and fill us with loving memories of those who passed them down. Prepare this the day before you want to roast it. Place the lamb on a cutting board. With the point of a sharp knife make deep slits all over, top and bottom, and insert garlic slivers. Mix all ingredients for marinade except water or broth. 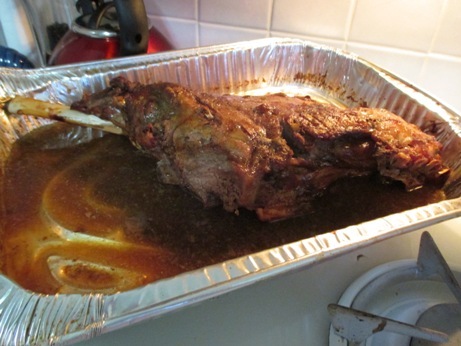 Place lamb in large plastic ziplock bag and pour in the marinade, reserving water or broth. Turn the bag over and over to make sure the lamb has been covered with marinade. Place in refrigerator and let marinate overnight, turning the bag over occasionally. When ready to roast, remove lamb from bag, place in roasting pan with the marinade and a cup of water or broth and reduce the oven heat to 350°. Roast for about 2 to 3 hours or until thermometer registers 175° for well-done (until skin is brown and crisp and juices run clear.) Some people like their lamb medium rare, so using your thermometer, roast accordingly and remove before the well-done stage. When I grill it, I start it out as above and place it in a disposable aluminum roasting pan. I have 4 burners on our gas grill, so after heating it to the max, I turn off the 2 center burners, leaving the outside burners on high, and place the pan in the center of the grill. I put down the cover and let it roast for 45 minutes, then check it. It does cook faster in the grill and the liquid evaporates quickly, so keep adding water or beef broth to the pan so you will have some au jus when it is done. Baste it often. Continue to let it cook until the thermometer reads the desired result. At the very end, I take the lamb out of the pan and set it right on the grill, over direct heat and let it quickly brown on all sides. This just takes a couple of minutes, so watch it carefully. We just want it to brown up, if it hasn’t done so already while in the pan. If using a charcoal grill, prepare and heat your coals. When they are ready, arrange them in a circle, pushing them away from the center so the pan will not be directly over the fire. Continue as for the gas grill, checking your thermometer periodically and adding liquid to the pan as necessary. When it has reached the temperature and doneness you like, remove from pan and place directly over hot coals for browning, if desired. The aroma is out of this world, which makes it very difficult not to sneak a taste or two before serving. I always serve a big platter of kalamata olives and feta cheese with this lamb. It all goes together in a lovely symphony of flavors! See you next time…yia sou! Thank you for the recipe, I love lamb. I will look at more of your food items. I always remember that”Big Fat Greek Wedding” when the teacher says what kind of spice is on these potatoes? I’ve been wondering about that ever since.